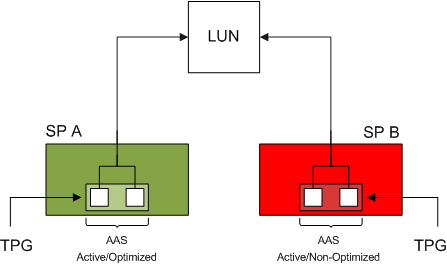 Asymmetric Logical Unit Access occurs when the access characteristics of a storage processor port relative to the LUN differs from another port in the array. This behavior occurs on Asymmetrical Active-Active arrays (AAA). Two well-know AAA arrays are the EMC CX and the HP EVA. In a AAA array both controllers can receive IO commands (active-active), but only one controller can issue IO to the LUN. This is the asymmetrical part. The opposite of a AAA array is a symmetric Active-Active array, like the EMC Symmetrix DMX, such an array can issue IO command to the LUN via both controllers. But for now let’s concentrate on AAA arrays and the HP EVA specifically. The controller in an AAA array who can issue commands is called the managing controller, paths to the LUN via ports of this controller are called optimized paths. IO sent to a port of the non-owning controller must be transferred to the owning controller internally and increases latency and have impact on the performance of the array. Due to this, paths leading to the LUN via the non-managing controller are called non-optimized paths. The default Native Multipathing Plugin (NMP) used by the storage stack in ESX4 uses two sub-plugins, the Storage Array Type Plug-in and Path Selection Plugins. Storage Array Type Plugins is used for path handling and the Path Selection Plugins is used for Path selection. It is interesting to know that the SATP is associated with all the physical paths to the array and is configured globally per array, but the PSP can be configured per LUN. The problem with the array specific VMW_SATP_EVA is that it doesn’t use Target Port Group Support (TPGS), Funny thing is that TPGS is critical when it comes to determining optimized and non-optimized paths. Therefore the VMware HCL list the generic VMW_SATP_ALUA as the supported SATP on EVA Active-Active arrays. Note the grouping of Target Ports per TPG per Controller are vendor specific! A target port reporting the active/optimized state belongs to the managing owner of the LUN and communicates directly with the LUN. A target port reporting the active/non-optimized state belongs to the non-managing owner of the LUN and the controller must send the IO via the multilink-ports to the managing controller of the LUN. For example, a ESX host with two HBA’s connected to a EVA 8100, SP A is the managing controller of LUN1. TPGS will report that the Active Optimized paths are HBA1:1:1 and HBA2:1:1. HBA1:2:1 and HBA2:2:1 are listed as the non-optimized paths. MRU:	Selects the path the ESX/ESXi host used most recently to access the given device. continues to use the new path while it is available. Round Robin (RR):Uses a path selection algorithm that rotates through all available paths enabling load balancing across the paths. Both MRU and Round Robin PSPs are ALUA aware.MRU selects the first working optimized path discovered at system boot time and uses non-optimized paths when all optimized paths are dead. When an optimized path becomes available again, MRU will switch back to the optimized path. This differs from traditional MRU behavoir where a administrator must manually fail back to a path. Per default Round Robin will issue IO across all optimized paths and will use non-optimized paths only if no optimized paths are available. Selecting the Fixed PSP on an ALUA enabled array defeats the purpose of ALUA support of the NMP architecture. 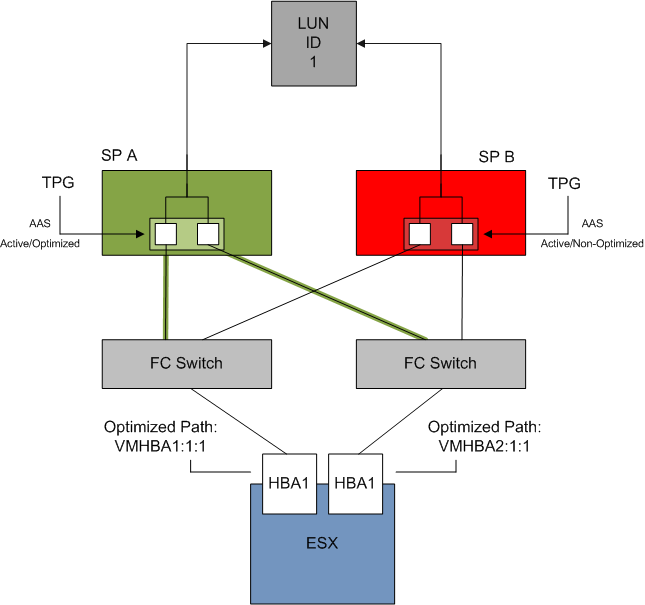 If the preferred path is configured to use a non-optimized path, ESX will use this path to issue IO, even though optimized paths might be available. My advice is to stick with MRU or Round Robin when using a ALUA aware SATP. VMware list MRU as the default supported PSP in the HCL, I asked VMware Global Support Services if Round Robin is supported even if it is not listed in the HCL. So the question arises, which PSP should I select? If you use MSCS configurations, using Round Robin is unsupported on the LUNs that are part of MSCS VMs. By selecting MRU ESX will only use the first optimized path discovered at boot, where Round Robin uses all optimized paths. MRU will use the first optimized path and does not load balance across HBA’s. ie. HBA1->LUN1, HBA2-LUN2, HBA1->LUN3, as where Round Robin will utilize all optimized paths of both HBA’s to send IO. Almost every vendor list Round Robin as best practice when using an ALUA array, generating better load-balance and aggregation of the available uplinks. Another point of interest is the IOOperationlimit, this setting specifies how much IO commands will be sent across one path before switching over to the next available optimized path. Before following best practise of your vendor, my advice is to read Chad’s post first: vSphere 4 NMP RR IOoperationsLimit bug and workaround. 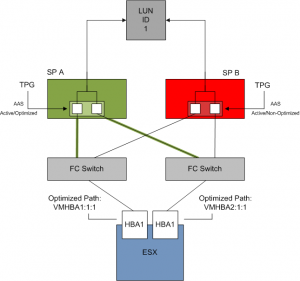 So how about the impact of Continuous Access on the path load balancing in ESX 4? To meet these requirements, CA will assign one controller as managing controller for all the member LUNS in the DR Group. Because all the target ports of controller belong to the same TPG, these target ports will report to ESX as the Active/Optimized paths to the LUNs of the DR Group. This behavior will impact the design of the DR Groups, how many LUNs will become a part of one DR Group? This will impact the load across both controllers, quite easily an imbalance can occur when “DR-Group managed controller affiliation” is not taken into consideration. Please be aware of the limitation of the amount of DR-Groups and the use of DR tunnels. The path between the source and destination controller is called a DR Tunnel (DRT), to ensure IO consistency CA uses only one path per DR Group. A DR group is allocated a set of write and copy resources per DR Tunnel and these resources are not infinite. When heavy traffic occurs, DR groups can temporarily run out of allocated write resources. Running out of write resources will have impact on the write performance of the virtual machine. For these reasons designing a balanced DR Group is something you must do together with your SAN-administrators, because the ratio DR Groups\DR Tunnels can have impact of your virtual environment as well. very great article. Especially the AAA and SAA differentiation wasnt that clear before reading! At my company we have 3 EVA 8100s and 4400. We are in the initial planning phases for our vsphere migration, and I really enjoy this (and other) articles regarding the best way to handle things between vsphere and EVAs. Thanks so much! I missing the important hint that “Implicit Lun Transfer (ILT)” is disabled for LUNs in DR groups. In VI3 this was a huge pain point because you set the pathing equal over the cluster and relied that the EVA will switch. It never switched over the DR group and the EVA suffered. Worst when using only one DR group having all LUNs on one Controller only. With vSphere where you determine the ownership from EVA side this is not a issue, but another come up – resignaturing. Anyone has an idea how to run CA over 2 different EVA Arrays with vSphere ? ESX 3.x you set DisallowSnapshotLun = 0 and HA + Kernel will take care. In vSphere Snapshot handling is different, but what will happend when the same NAA came up with different model ? It will need to remount it and mask the LUN. Or does the ESX remember a forced mount forever (this DS can show up with this and this parameters) . I assume a forced mount put the LUN properties into the VMFS header (need to hexview diff this). My “simple Campus CA EVA SAN with different EVAs non-SRM” approach i will try tomorrow is creating a Script looking for serious amount of path dead conditions – masking the “failed EVA” per device name (HSV210 / HSV300) – remounting the data-store forced. The problem is it assumes a complete EVA will fail – which is actually not a issue where only one LUN is shared. Also the approach is not easy to test in a hot environment with a single test LUN in a DR group. Masking the controller number with LUN would allow a hot test, but what happens when the Host reboots without access to the failed EVA – will the controller number remain the same ? Will it mask the remaining EVA too (in case the lower EVA will fail) ? Can i assign a fixed controller number with “persistent binding” within the HBA ?